Willys MB, Ford GPW (1941-1945) w/ 4-134 L-Head engine. Jeep CJ-3B (1953-1964) w/ 4-134 L-Head engine. Jeep CJ-5 (1955-1966) w/ 4-134 F-Head engine. 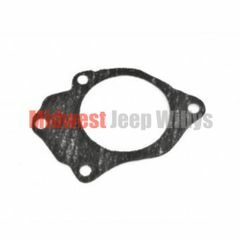 Jeep CJ-5 (1967-1971) w/ 4-134 F-Head engine; without Emission Pump. Jeep CJ-6 (1955-1966) w/ 4-134 F-Head engine. Jeep CJ-6 (1967-1971) w/ 4-134 F-Head engine; without Emission Pump. Jeep C101 (1967-1971) w/ 4-134 F-Head engine; without Emission Pump. Jeep Jeepster (1948-1950) w/ 4-134 L-Head engine. Jeep Jeepster (1950) w/ 4-134 F-Head engine.